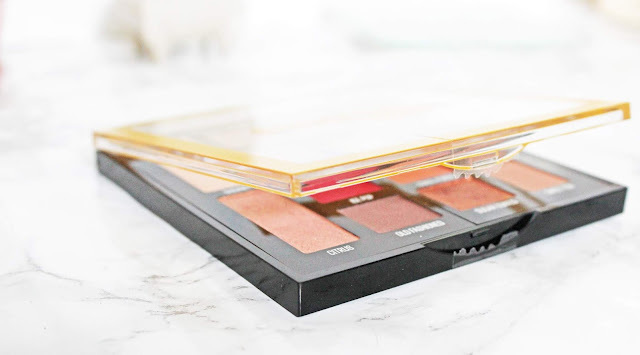 I kind of fell in love with this palette when I saw it on Maybelline's twitter. The swatches were amazing! The pop of red and the rose gold were so amazing! They shared the photos like 2 months before the launch and I'm not going to lie I kind of forgot about it until I saw it on display at the store about a month ago. Then I remembered the swatches and was excited all over again! So let's talk about what you get in this palette. This palette comes with 12 shadows. 4 of which are large "base shade" pans. The colours are vibrant and "citrus & summer inspired." Maybelline says they are citrus infused. They are a mix of matte and shimmer. From rose and gold base colours to bright pinky red and yellow. This palette has quite the range. 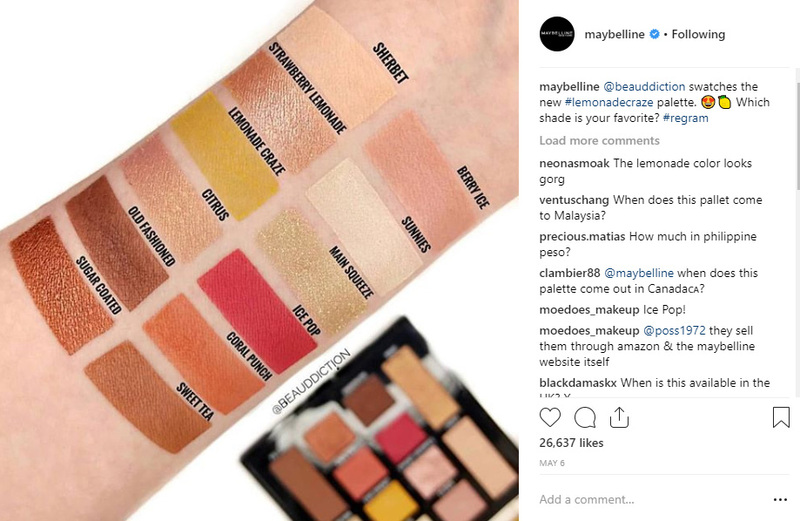 The colours that popped out to me most when I saw the promo swatched on Maybelline's Instagram were, Ice Pop, a bright pink with red undertones, and Sugar Coated, a rose gold shimmer. 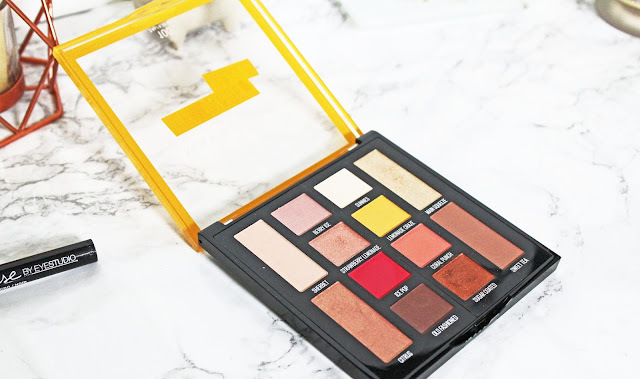 I fell for the palette from first sight! I mean look at this! So when I finally got this palette I was drying to jump in. I couldn't even wait for photos. I had to swatch Ice Pop and Sugar Coated. I also dipped into Coral Punch. 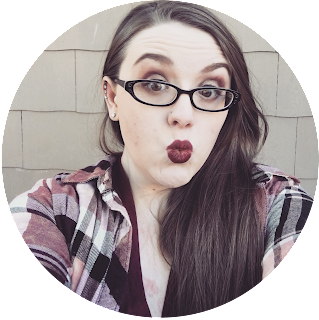 My first thoughts where that the shadows were very smooth to the touch, had really great pigment and that they were really pretty. Here my first dip from my insta stories. I also dipped into Main Squeeze and Citrus. I really like the almost orange undertones of Cirus. It has a copper warmth too it. Main Squeeze is super exciting because it has holo! It's a very pale holo. I've had a very hard time getting it on camera. I finally got a little bit with my iPhone flash. It's really pale so it might not show up on your computer screen. If you can't see it try watching on your phone. You can also find it on my Instagram in the Makeup Highlight. So after playing with some swatches, it was time to try it try it on the eyes. I took Ice Pop in the crease and buffed it in with a fluffy brush. Then I tool Sugar Coated on the lid and packed it on with my finger. I find that the almost metallic shades go on better with a finger. I also took Ice Pop on the outer lower lash and sugar coated on the inner lower lash. I was in a hurry so that's all I did. I am loving the way these shadows are blending so far. The colours and pigments are gorgeous! They are really smooth shadows and blend into each other well. I can't wait to try out all the shades and post my full review soon! 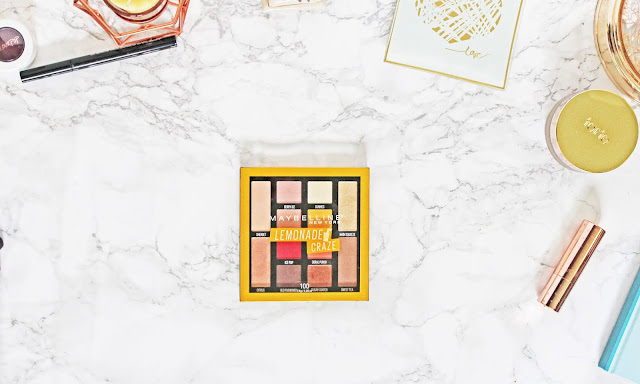 Have you tried the Maybelline Lemonade Craze Palette? What did you think? Let me know in the comments!